After coming back from a recent work trip I spent a day at home with Hannah getting our house/life back in order and noticed that our refrigerator was filled with lots of random leftovers and ingredients. Not one to waste anything (if I can help it), my gears started turning trying to figure out what I could make of this assortment of food and upon realizing that we had tons of sliced ham and turkey, Swiss cheese, Italian bread, and a few tiny jars of raspberry jam I immediately thought of making Monte Cristo sandwiches. The weird thing is that I have actually never eaten one. 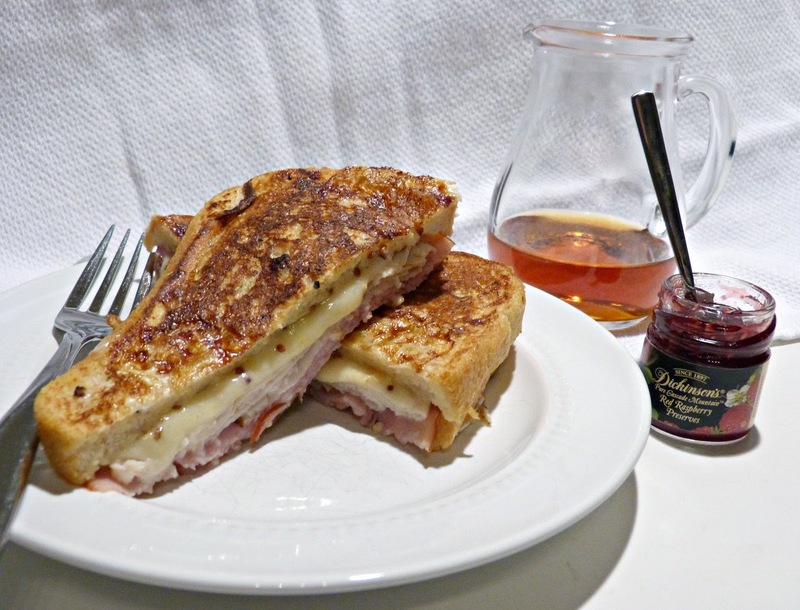 At Ocean Breeze (the family favorite spot I mentioned earlier), the Monte Cristo was more of a Croque Monsieur meets French Toast and that was my inspiration for our sandwich. Essentially, you build a sandwich with layers of sliced ham, turkey and Swiss cheese with a little Dijon mustard spread inside two thick slices of bread and then dip the bread in an egg custard before pan-frying until the bread becomes golden and the cheese melty. Like French toast, I serve this messy sandwich with a knife and fork and a combination of maple syrup (because that's how I have seen it served before) and raspberry jam (because after doing research, this topping frequently came up and I liked the sound of it). 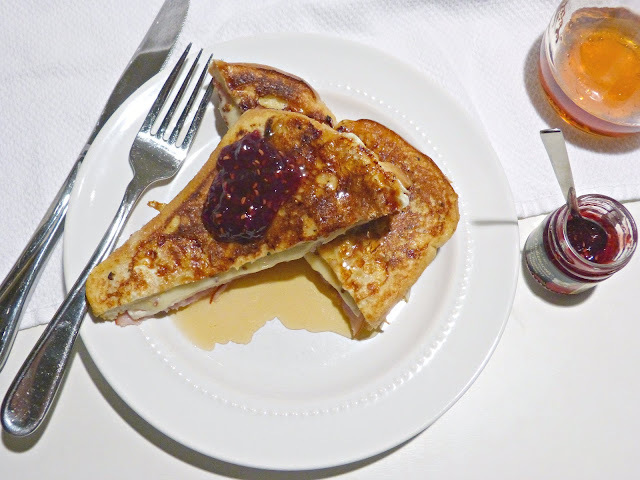 I have seen it topped with powdered sugar before, but I liked the idea of the sweet maple and raspberry flavors along with the punchy mustard and Swiss. It turned out to be a winning combination and an easy, but decadent dish. It's the perfect dish for when you can't decide what you're in the mood for: breakfast or dinner, savory or sweet. This dish has you covered! Coat a griddle or large frying pan with cooking spray and heat over medium heat. In a small bowl, whisk mayonnaise and mustards together. Set aside. To assemble the sandwiches, place two slices of bread on your work surface-- these will the bases of your two sandwiches. Spread each slice of bread evenly with half of the mustard and mayonnaise mixture. Top with one slice of cheese. Continue by layering two slices of turkey and two slices of ham on each. Top with another slice of cheese. Spread the remaining mustard and mayonnaise mixture evenly over the inside of the remaining two bread slices. Place the slices sauce-side down on the prepared sandwich halves and set aside. In a shallow bowl, whisk together eggs, milk, paprika, and salt and pepper, to taste. Holding the sandwiches together with your hands or tongs, carefully place each one in the egg mixture bread-side down, allowing the bread to fully soak in the egg mixture. Flip the sandwiches to allow the other slice of bread to do the same. Transfer the sandwiches to the hot griddle or pan and cook covered on low until the bread is golden and cheese begins to melt. Carefully flip the sandwiches over, cover, and cook until the other half of the sandwich is brown as well. Transfer the warm sandwiches to a plate and top with maple syrup and raspberry jam. Enjoy with a fork and knife.